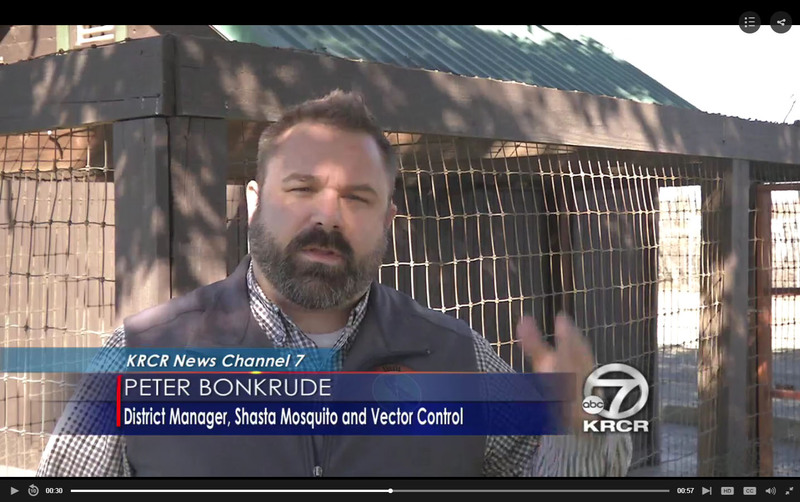 KRCR Reports on How "Warm weather spurs increase in mosquito reports"
“I’ve lived in this town for over 30 years and I’ve never seen mosquitoes this bad!” A phrase we commonly hear from every caller concerned with mosquitoes in and around their home and likely the same phrase that started mosquito control in California over a hundred years ago! The Shasta Mosquito and Vector Control District (SMVCD) was created in 1919 to prevent malaria in Shasta County and our mission to protect the public’s health has remained unchanged throughout the years. Although our mission is still the same, the way we control mosquitoes has evolved pretty dramatically. "The Mosquito Rap video is part of [the GLACVCD's] new Mosquito S.W.A.T. Lab - a mobile science lab aimed at educating students about mosquito-borne diseases. [...] Video produced in-house at the Greater Los Angeles County Vector Control District. Written and performed by Metamorphosis" (Greater Los Angeles County Vector Control District).